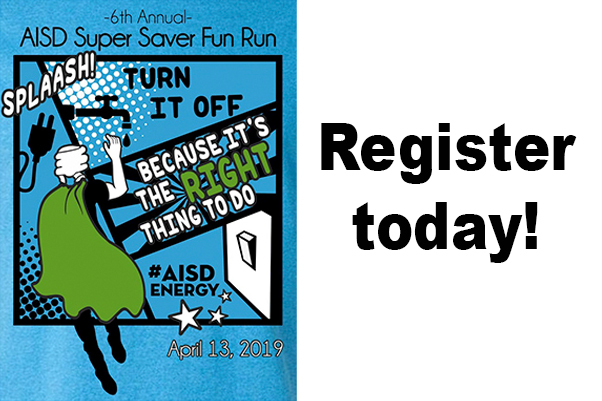 Register today for the 6th annual Arlington ISD Super Saver Fun Run! This run/walk 5K will be at 8:30 a.m. on Saturday, April 13, 2019, at River Legacy Park in Arlington. The run is hosted by the AISD Plant Services department. Register by March 29 for an early bird discount. Awards will be given out for top overall male and female finishers and in each age group for the 5K. Packet pickup is from 7 a.m. to 5 p.m. on Friday, April 12 at the AISD Professional Development Center at 1111 W. Arbrook Blvd. Click here to download a registration form or go to www.getmeregistered.com/AISDSuperSaverFunRun to register.